Our first trip to Las Vegas (Nov. 2010) as a couple was also hubby’s first trip there ever. We would be there because he was competing in the Firefighter Combat Challenge World’s event. He and his team had prepared all year, and we were all excited to see how they would do. Little did I know that hubby was preparing for something else during our trip to Vegas. Nov. 14, 2010 I took hubby to the airport for his journey to Vegas. Two days later, after finishing up at work, I boarded a plane to meet him out there. He met me in baggage claim, and off we went to do a little sightseeing. He wanted me to show him around since I had been there many times before. From the airport, we parked at Imperial Palace and walked to Caesar’s Palace. I cannot even begin to summarize the little journey we took through Caesar’s. Hubby was very focused and was not his usual self. I attributed this to the fact that he was still competing during the day and has a tendency to be “in the zone” for these competitions. So, I thought nothing of it. We got gelato, walked around, and then found ourselves outside. At the service entrance to the hotel. Eventually, we found ourselves back at the front entrance. In the gardens out front…like, in the grass…where you’re not supposed to go. Throughout this adventure I kept asking hubby “Where are you trying to go? I can help you find it…I’ve been here before.” He was dragging me by the hand and, to be honest, I was getting frustrated because I knew he had no idea where he was going. He had never been to Vegas! Eventually, we made it to the front of Caesar’s, near Serendipity’s 2 restaurant. We walked to the fountains and before I knew it hubby was on bended knee in front of me. I was completely taken off guard and all I could say was “Shut up. Are you serious?! ?” I quickly recovered from my surprise and then said yes. We were engaged Nov. 16 @ about 10:30pm Pacific time. Now, although we had been ring shopping and we knew we would get married someday, we were on a plan to pay off debts and begin our savings plan for our future (which included an engagement ring that hubby kept saying “someday” about). So, I really did not expect him to propsose when he did. I didn’t know it, but hubby had also asked my parents’ permission to marry me before he left for Vegas. It was the same day (Friday, Nov. 13, 2010) that we found out my brother and sis-in-law were expecting their first child. What a great day for my parents who celebrate each Friday the 13th more than their anniversary! 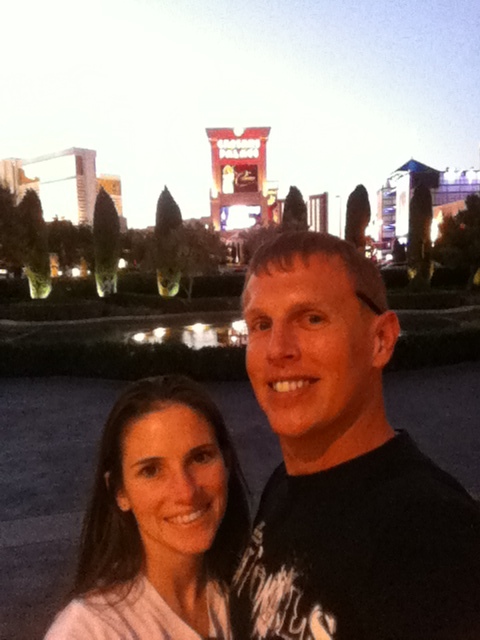 During our honeymoon in Vegas, we revisited the place where we were engaged. It was nice to sit and laugh over our precious adventure – through the manicured gardens of Caesar’s Palace and all – that was his proposal. On our honeymoon, returning to where he proposed at Caesar's Palace.